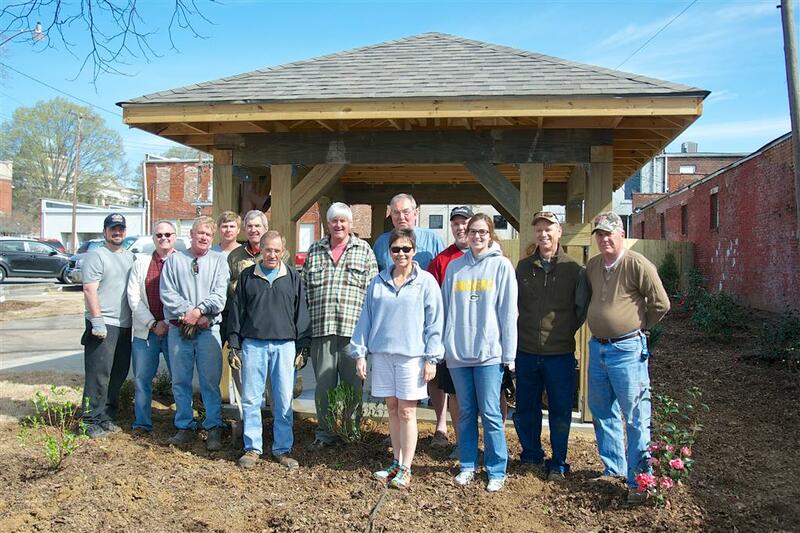 On Saturday March 5th, volunteers from the Athens Rotary Club worked on the new “Pecan Park” located at the corner of Marion and Green Street. 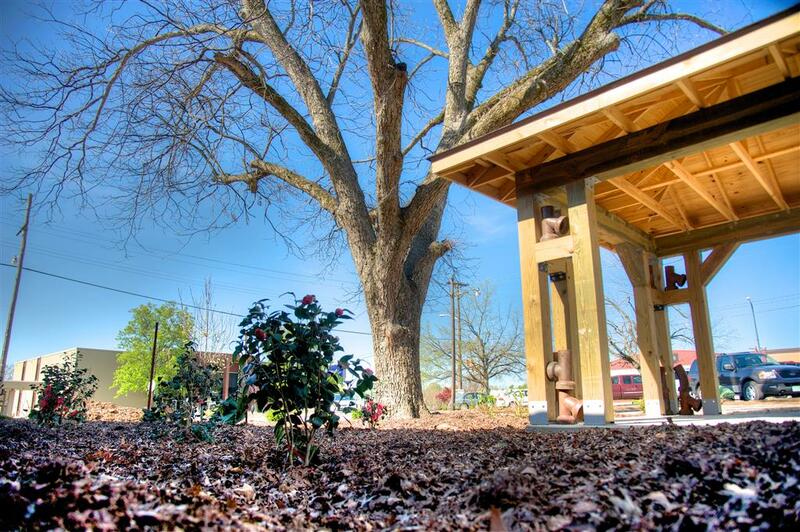 Rotarians planted trees, flowers, shrubs, and assisted with landscaping in the new green space that the City of Athens prepared beneath the old tree. 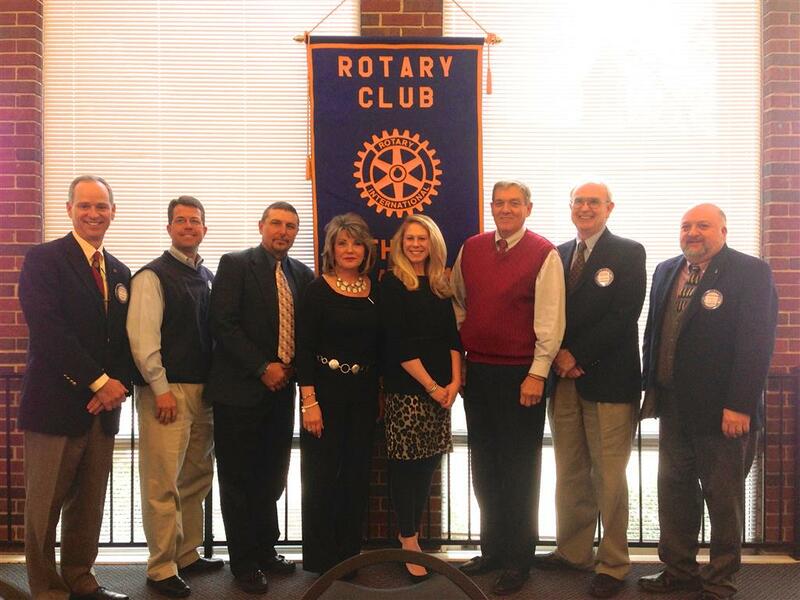 Athens Rotary Club welcomed three new members on January 31, 2014: Wayne Kuykendall (proposed by Doug Logan), Louis Tominack (Jeff Hodges), and Jennifer Williamson (Sally Marks). 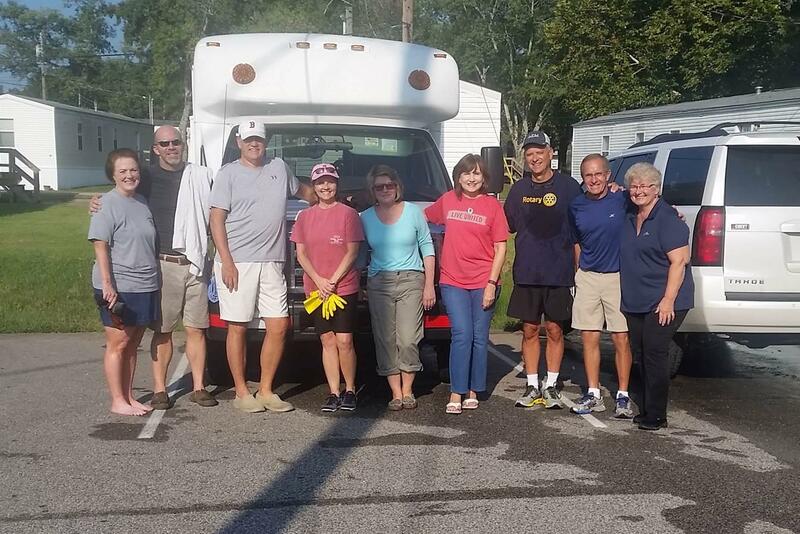 Pictured from left to right: Jimmy Woodroof, Jeff Hodges, Louis Tominack, Sally Marks, Jennifer Williamson, Wayne Kuykendall, Doug Logan, and 2013-2014 President Jim Moffatt. 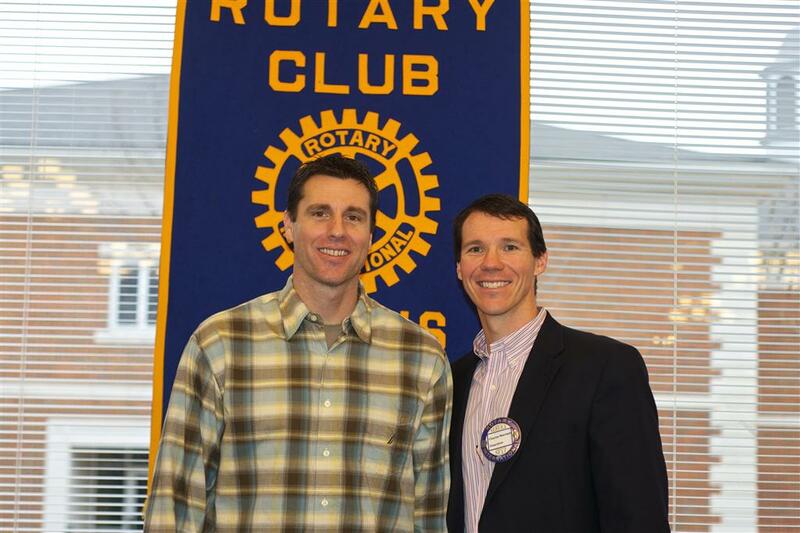 Athens Rotary is proud to welcome Lee Noah to our club! 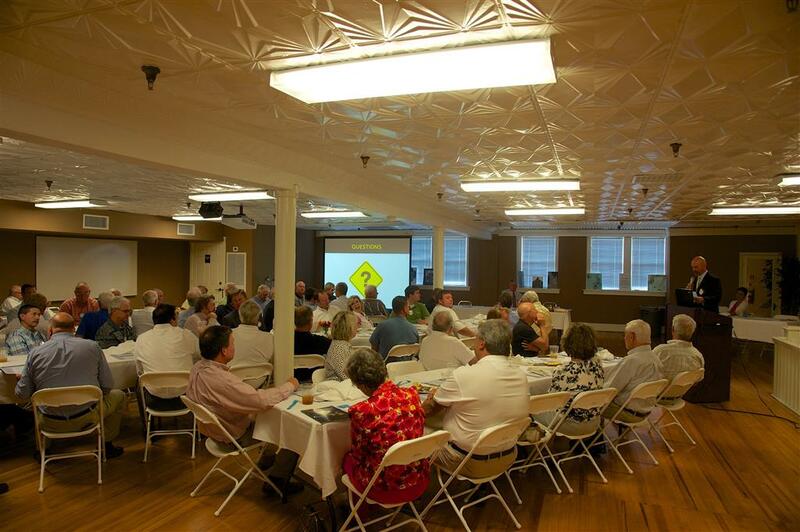 Athens Police Chief Floyd Johnson updated the club on activities within the APD. The department recently rounded up drug dealers as part of a six-month undercover operation known as Operation Harvest Festival. 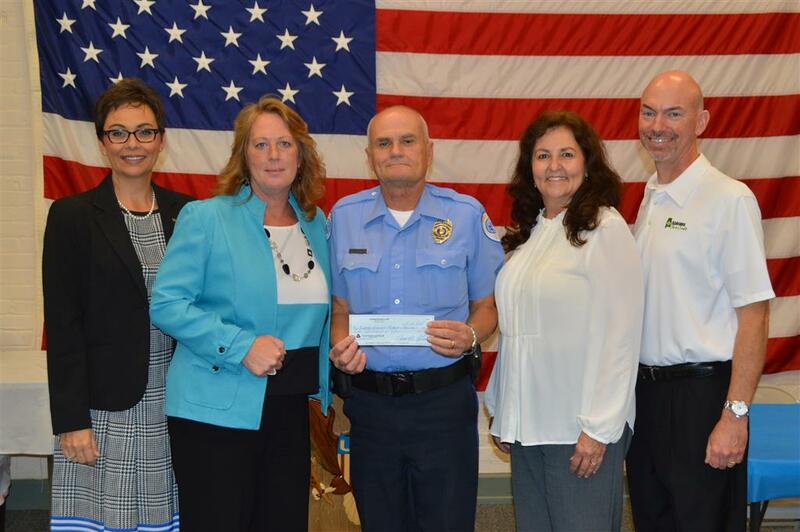 APD also recently began operating four SUVs that run on Compressed Natural Gas (CNG) from the cities CNG station. Only one card remains in the deck…the elusive Joker! 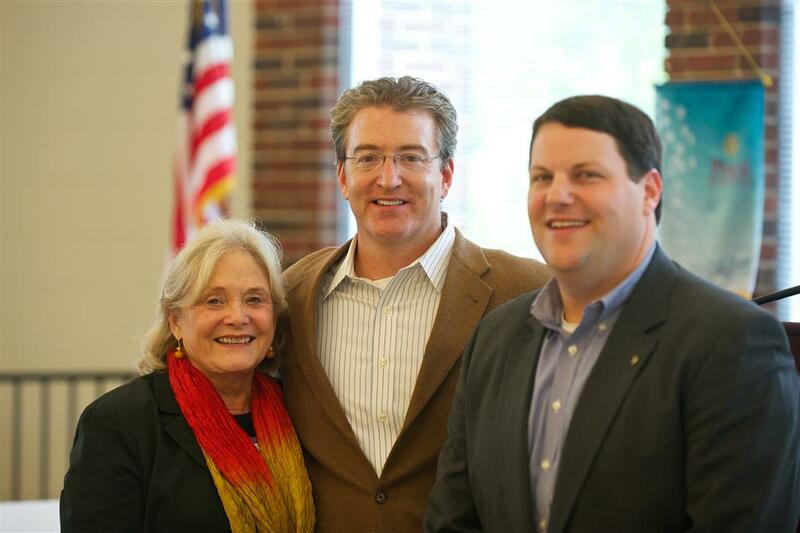 Donna Jo and John Curtis hosted the Athens Rotary club at their farm on November 1, 2013. 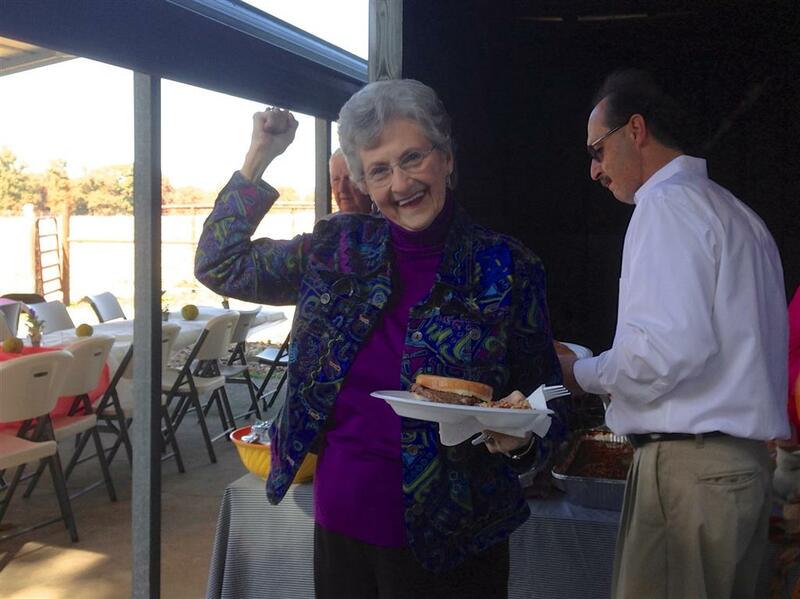 The Limestone chapter of the Alabama Cattlemen’s Association provided lunch. 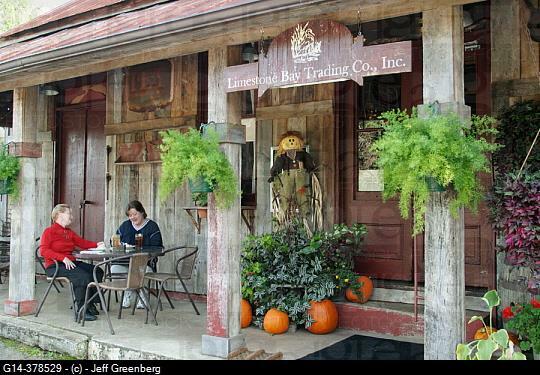 The fall weather and colors could not have been more beautiful! 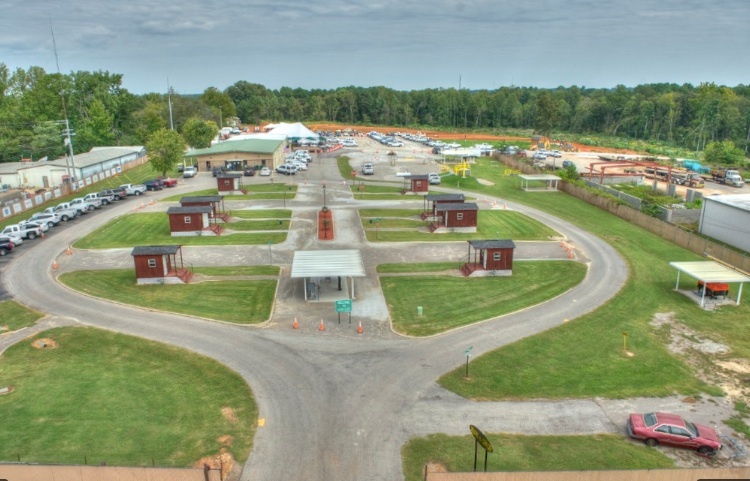 Don't Forget: The October 18th meeting will be at the Athens Gas "Leak City" training facility at 807 East Sanderfer Rd off of Hwy 31 South. 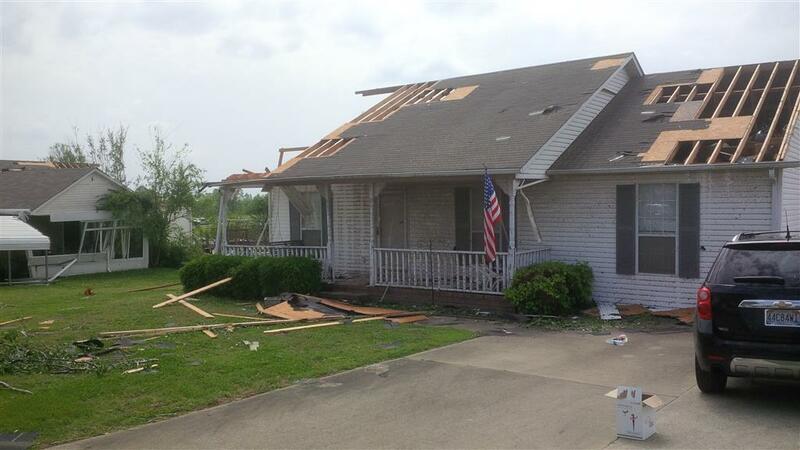 For directions call Mason Matthews at 256-434-6122. 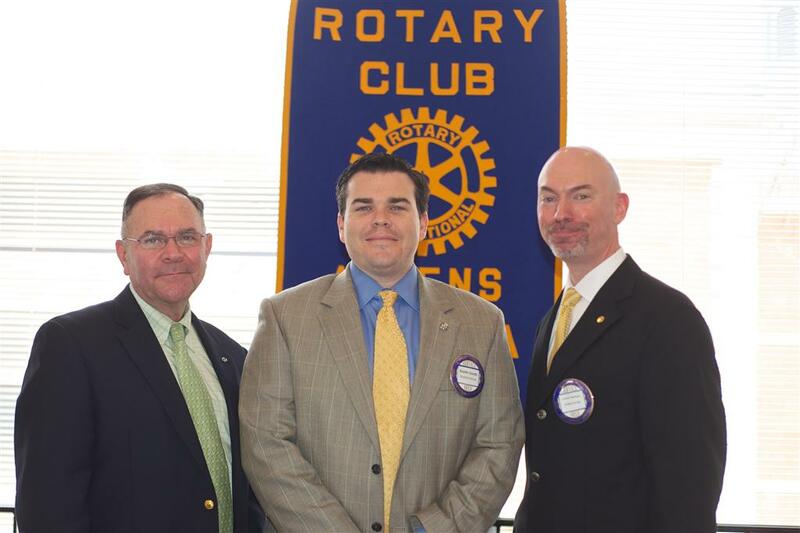 Athens Rotary Club is proud to welcome new members Dr. Patrick Boyett and Dr. William Lawrence. 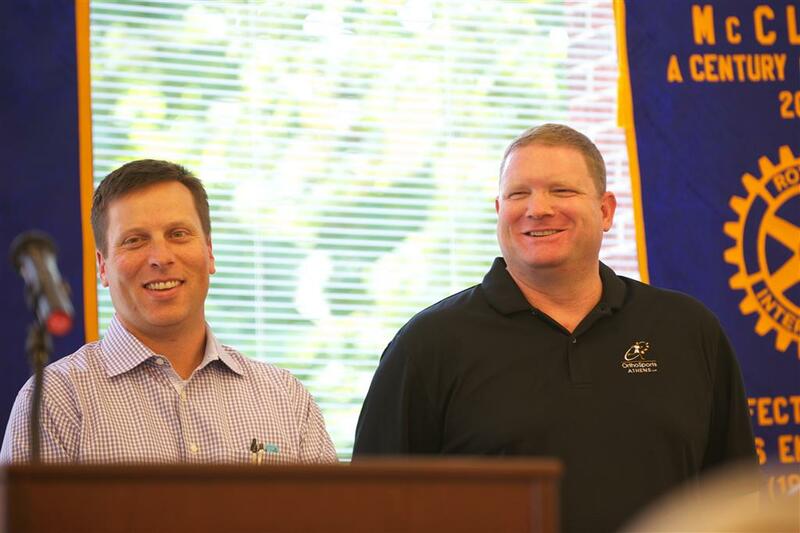 The doctors practice sports medicine and orthopedic surgery together at OrthoSports Athens, LLC. 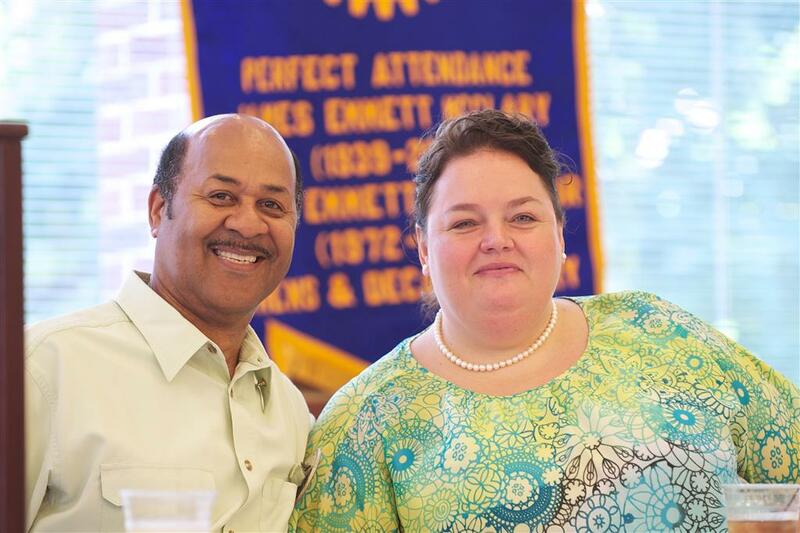 Athens Rotary heard a stirring presentation from Tracy Guidry, Director of the Athens Boys and Girls Club. A safe, positive environment: The Club is a safe haven where members feel physically and emotionally secure at all times. Fun: The Club facility, staff, and program offerings create a welcoming, positive environment that allows members to engage in play, enjoy their play time and be happy and eager to come to the Club. Supportive relationships: The Club ensures that every young person feel connected to one or more adults and has friendships with peers. Opportunities and expectations: Club staff and programs consistently communicate the expectation that every child has the potential to excel, be productive and succeed at the Club and in life. 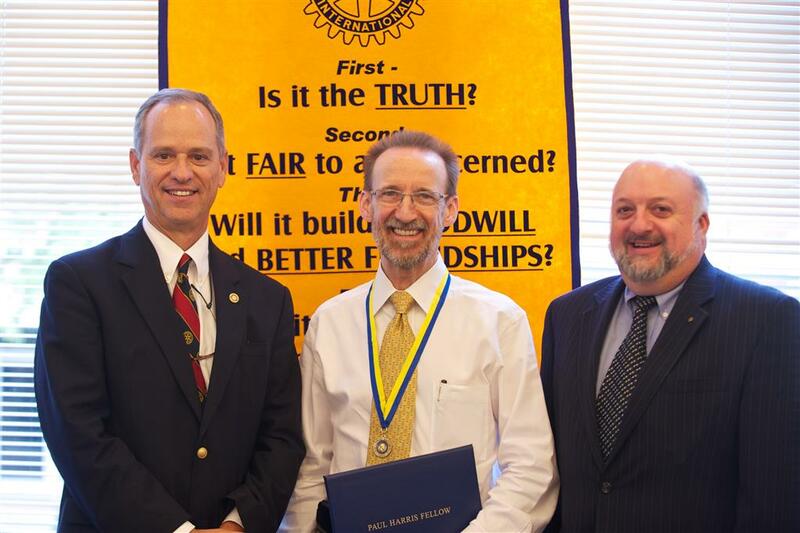 The Athens Rotary Club recognized Everett Osborne as its 2013 Paul Harris Fellow. 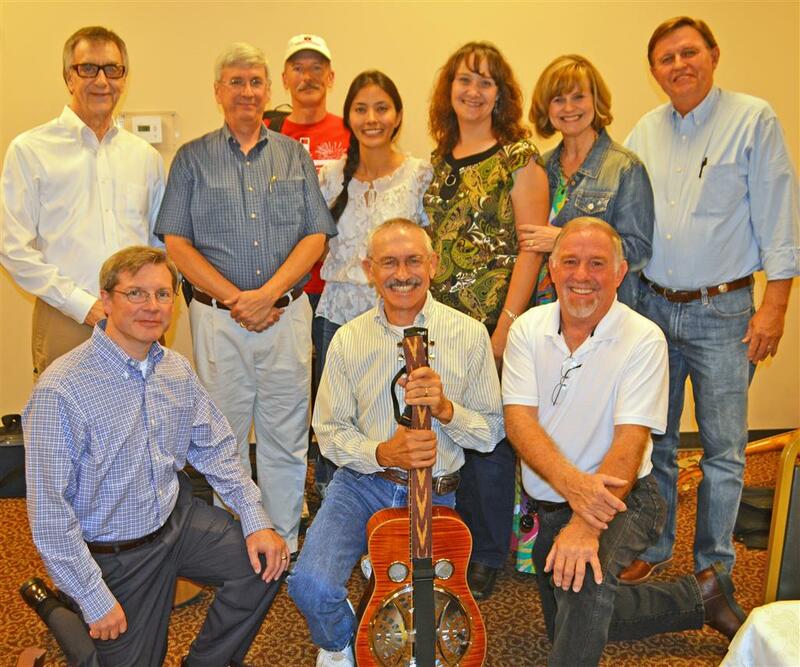 Judge Jimmy made the presentation and they were joined on stage by approximately seventeen previous Paul Harris Fellows from the Athens club. The Huntsville Botanical Gardens is celebrating its 25th year of operation in 2013. 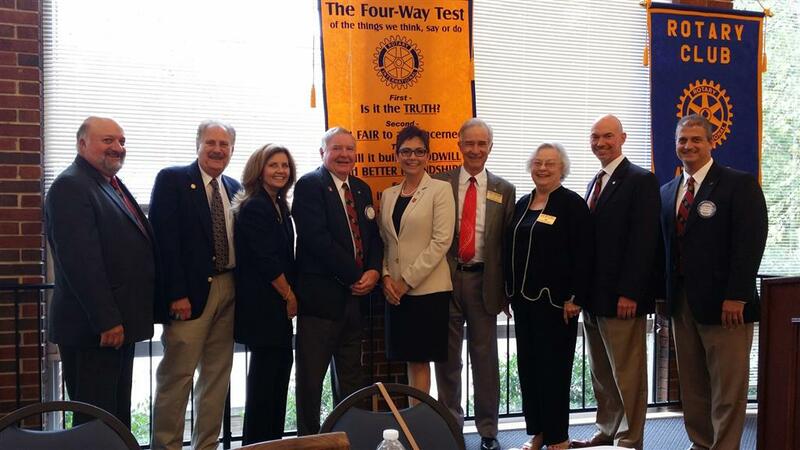 Athens Rotary was proud to welcome Paula Steigerwald (CEO) and Harvey Cotten, (VP and Chief Horticulturist) to update the club on the gardens. 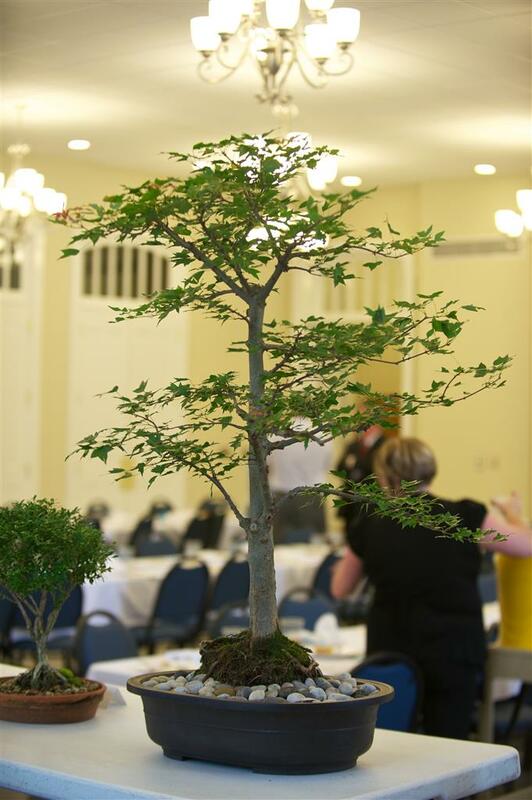 Judge Jimmy Woodroof also brought several excellent examples of Bonsai trees from his personal collection. 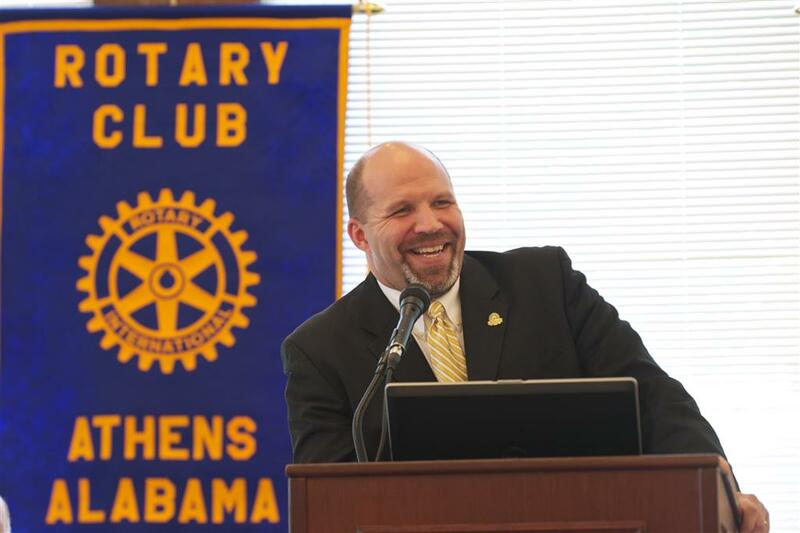 New Athens City School superintendent Trey Holliday updated the club on the state of the City school system, including the status of is 45 day entry plan. Mr. Holliday also briefed the club on changes coming to the school systems, which includes the “Power Up” program designed to place technology in the hands of all City school students and teachers. Athens City Schools is home to: 3,180 students; 418 employees; and 222 teachers. 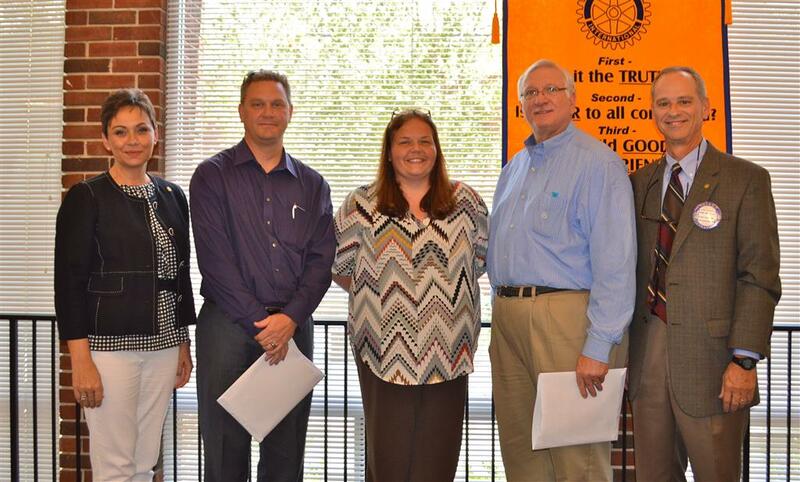 The Athens Rotary Club recognized two very special people for years of Rotary service on August 2, 2013. 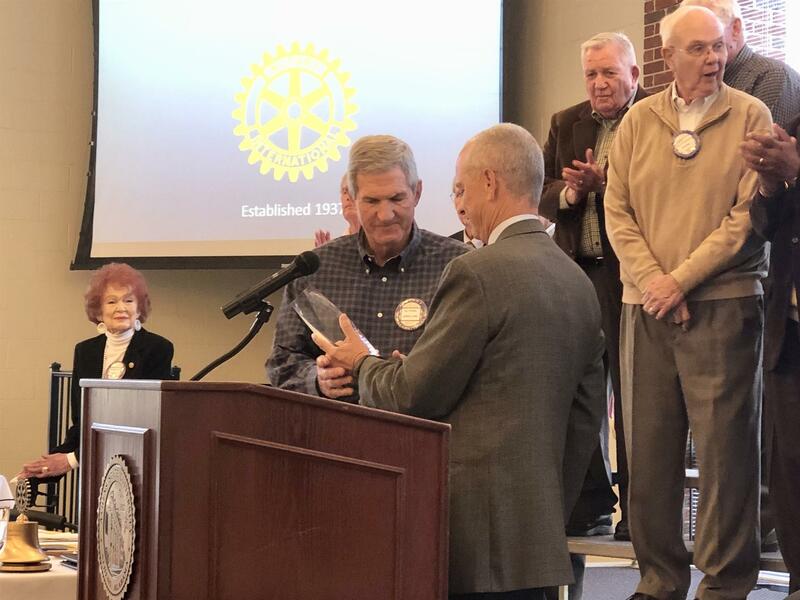 Bill Hightower celebrated 40 years of Rotary service and Curtis Grissom was recognized for 25 years. The club response with a standing ovation Congratulations to these fine gentlemen! 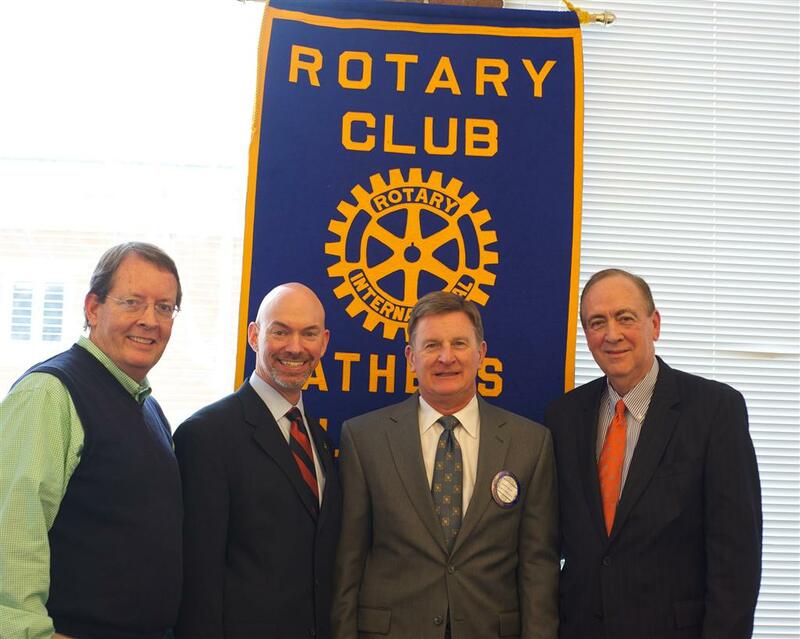 Left to right: Athens President Jim Moffatt; Curtis Grissom; Bill Hightower; District 6860 Governor Tom Greene. 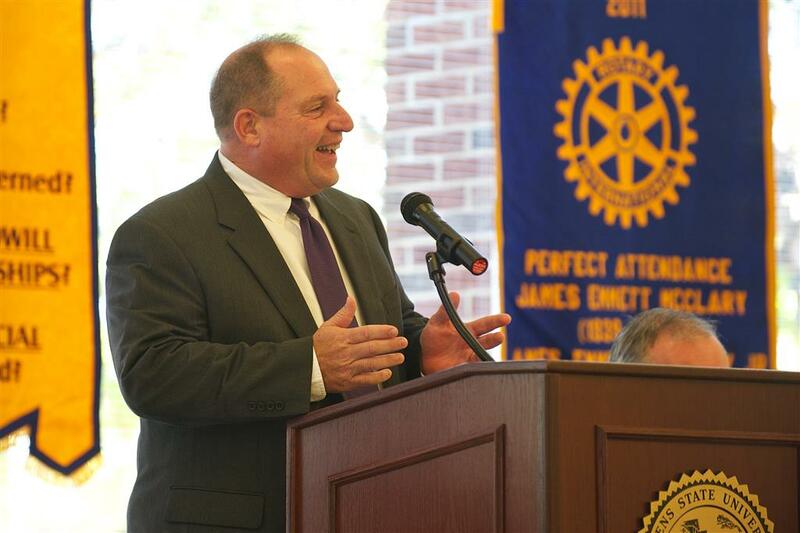 This past week our speaker was our Rotary District Governor, Tom Greene. 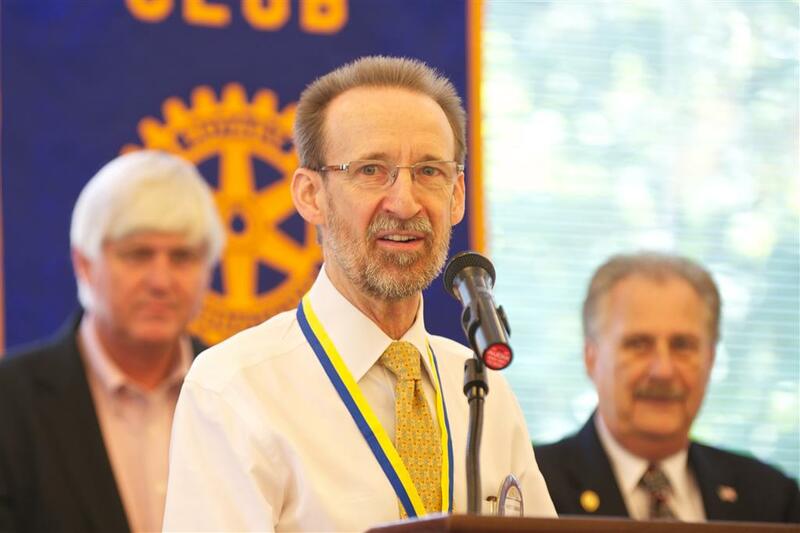 Mr. Greene spoke to the club about his definition of leadership and how that relates to being a Rotarian and building stronger communities. 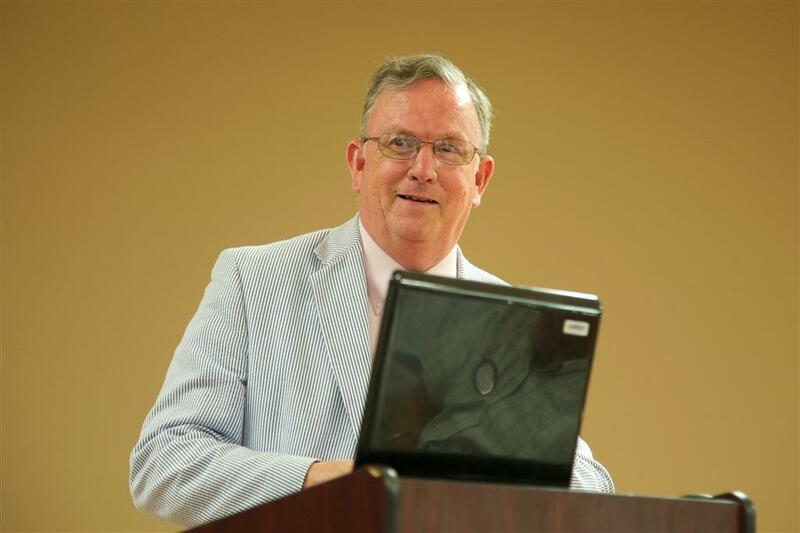 Dr. Bob Glenn, a Sherlock Holmes scholar, shared his knowledge of Sir Arthur Conan Doyle's most famous character and why he endures to this day. Fredrick Martin promised to pose for the camera if he had a chance! 2009 - 2010 Past President Frederick Martin (Left) is presented a long overdue President's Pin from 2012 - 2013 Past President Jason Thomas (Right). 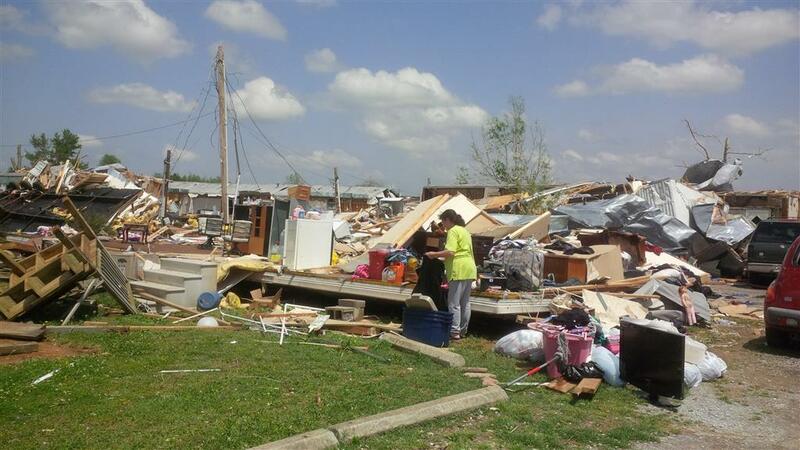 Eighteen Athens Rotarians and friends gathered on Saturday morning, June 8, 2013 to clear brush and debris from the former W. E. Estes & Son property. 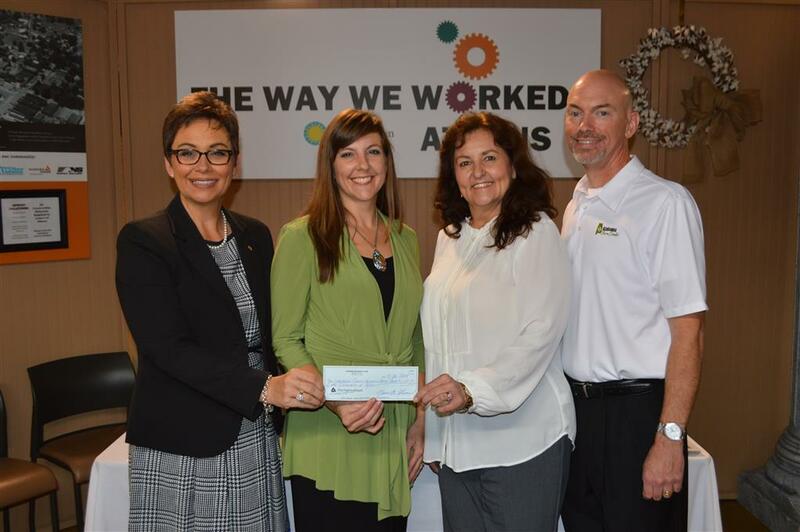 A portion of this property will be used for the new High Cotton Art Incubator. 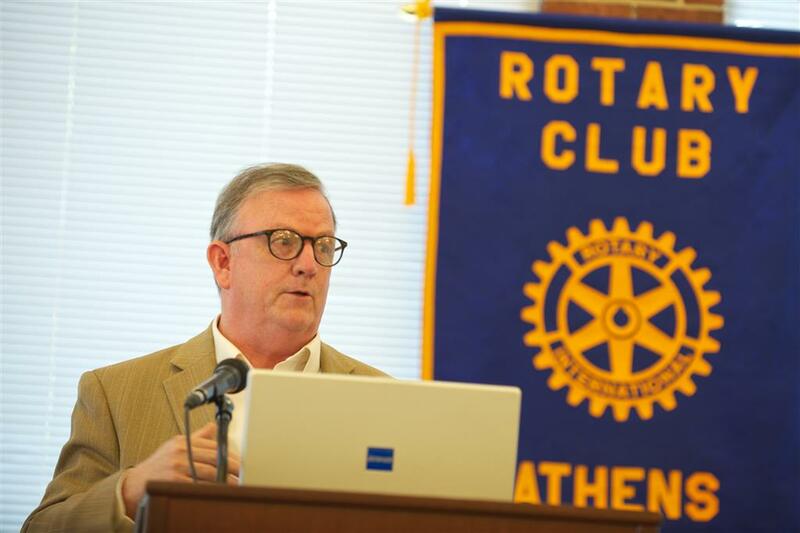 Athens State University President Dr. Bob Glenn updated the club on the growth of the University including renovations on campus, the Alabama Center for the Arts, and the Athens State Center for Lifelong Learning. 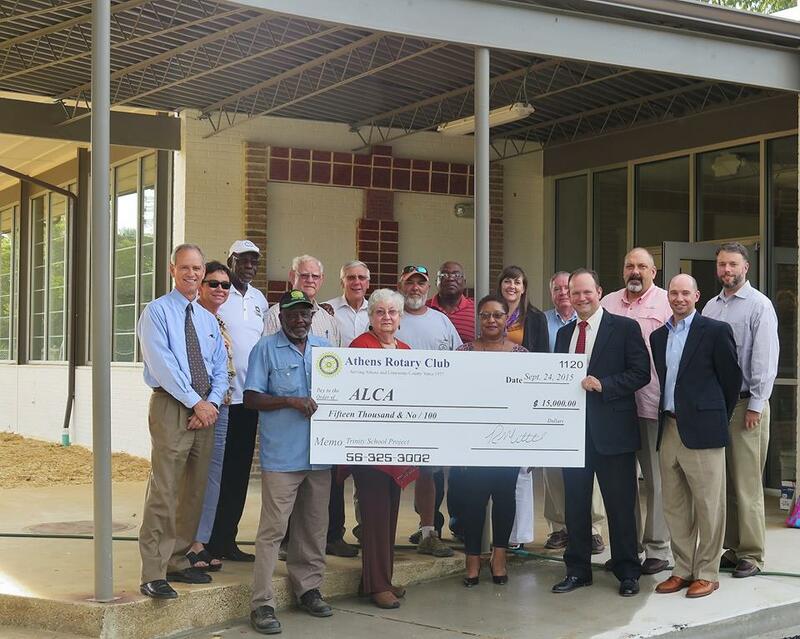 Please visit the links below to learn more about these exciting additions to Athens State. 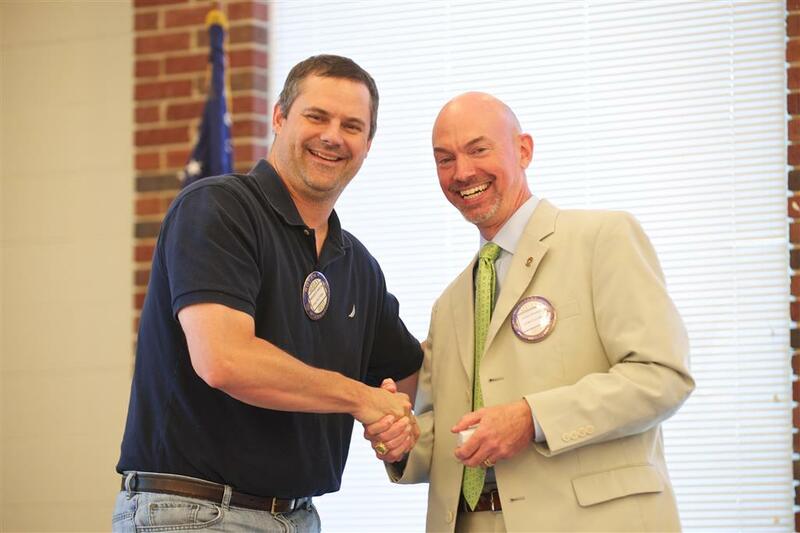 The Athens Rotary Club will host its annual awards night on Saturday June 29th, 2013 from 6pm-9pm at the Limestone County Events Center. or RVSP online via the club calendar on this website. 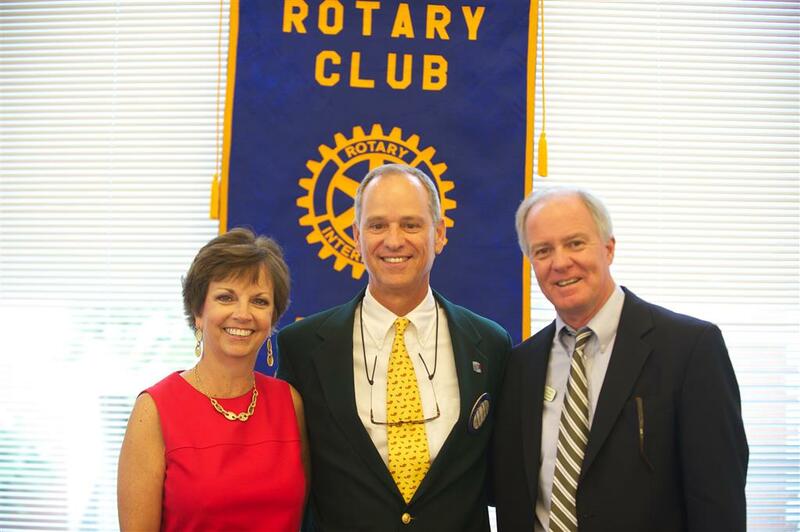 Dr. Stephen Black shared his inspiring vision for, and insights to, community service with the Athens Rotary Club. 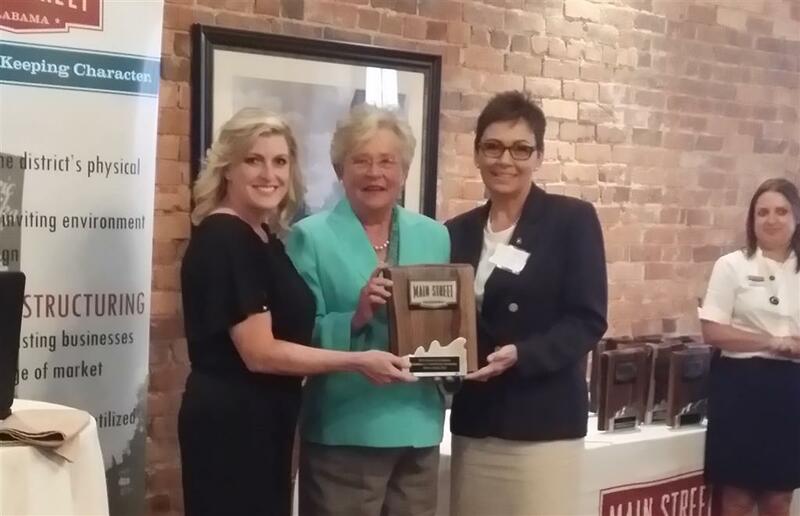 Dr. Black is the director of Impact Alabama. 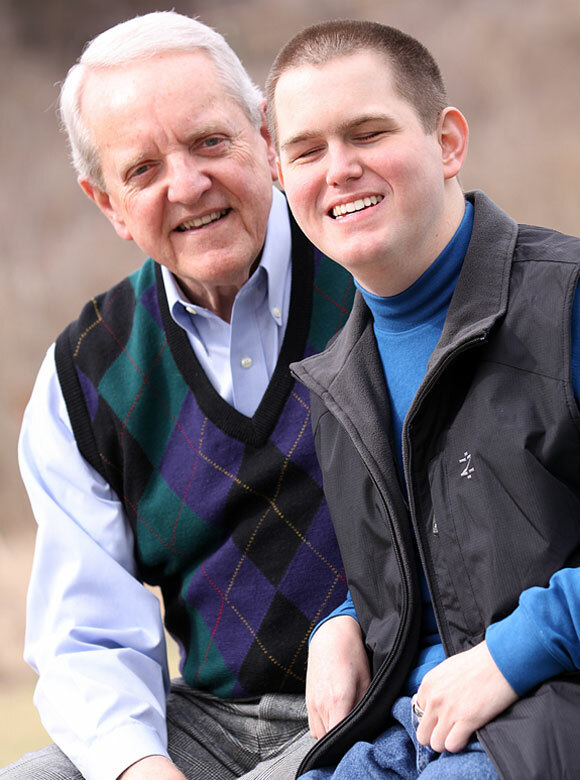 Since 2004, Impact Alabama’s Focus First initiative has trained thousands of student volunteers from over 20 colleges and universities across the state who have screened over 48,000 children for vision problems. Steve Maples, Executive Director of the Von Braun Center (VBC), shared 37 years of memories from the Center. Steve shared many interesting facts regarding the history and operation of the VBC including some of the more interesting artists to visit over the years. 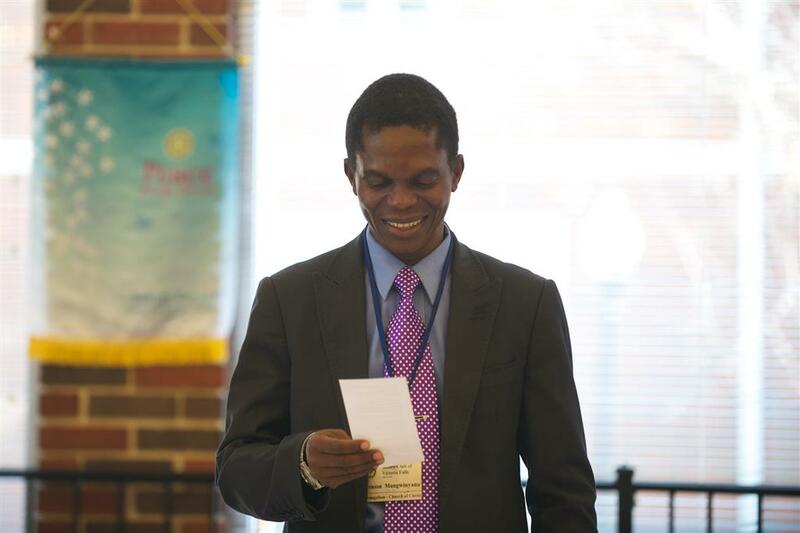 The Athens Rotary Club also had the pleasure of welcoming Tenson Mangwinyana from the Rotary Club of Victoria Falls (District 9210) located in Victoria Falls, Zimbabwe. 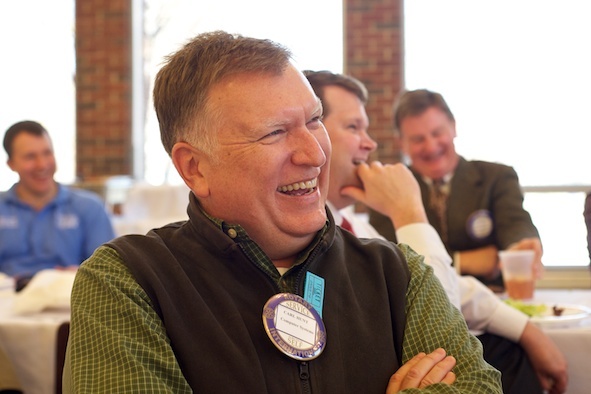 Tenson told the club about his home, which included several photos of their local Rotary Club. 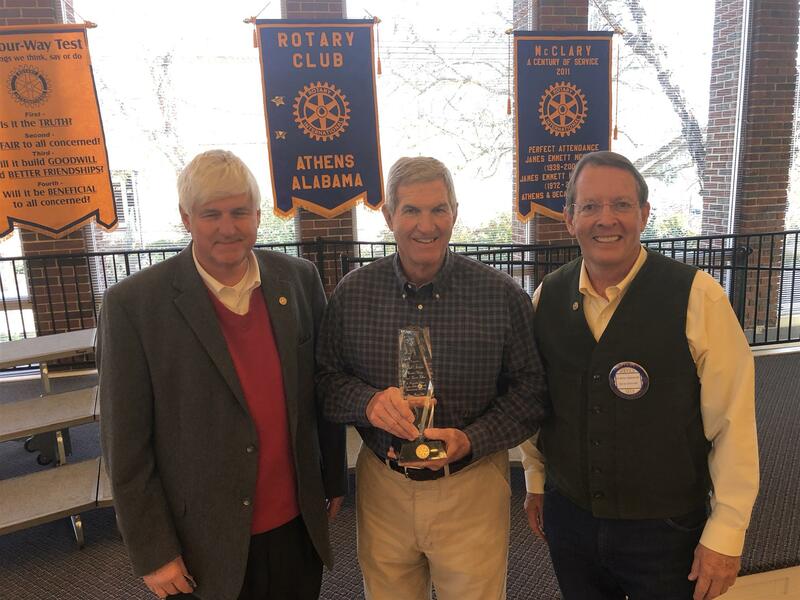 Tenson has a passion for Rotary and it’s vision and we are honored to have him in Athens. 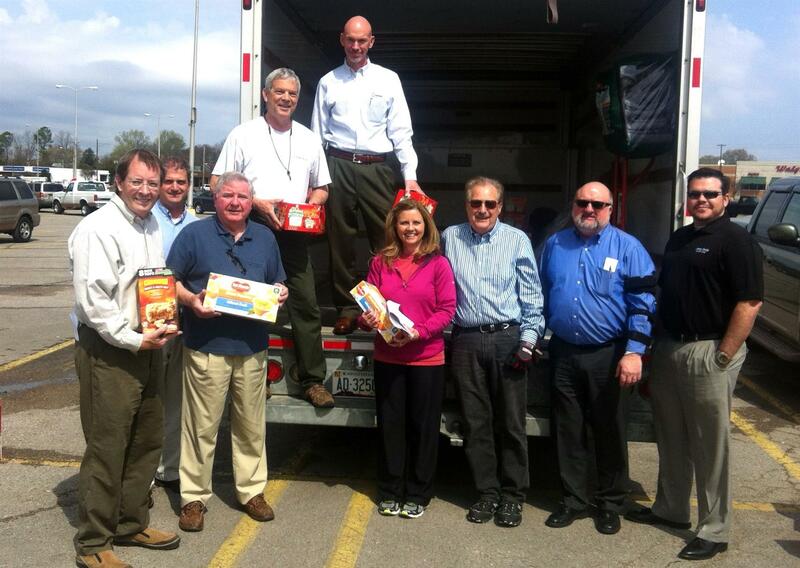 Rotarians and friends gathered on the afternoon of March 17, 2013 to improve our city. They planted more than 50 trees and shrubs on Jefferson Street between Green Street and Forrest Street. This projected was lead by Doug Gates and Barry Hickman. 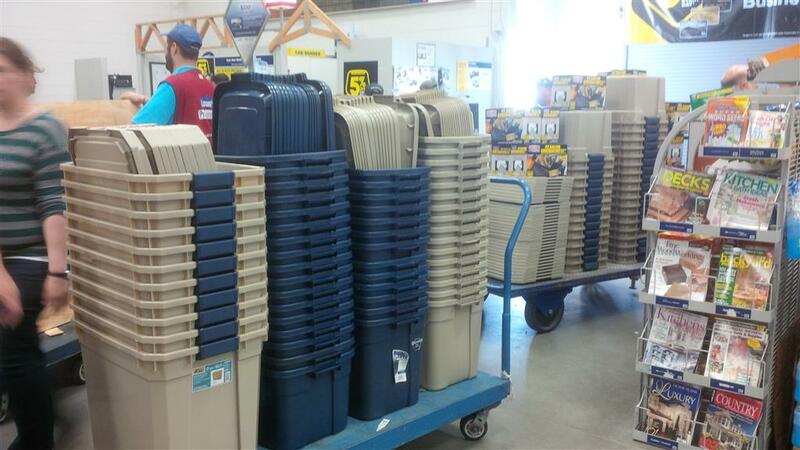 It was a resounding success! 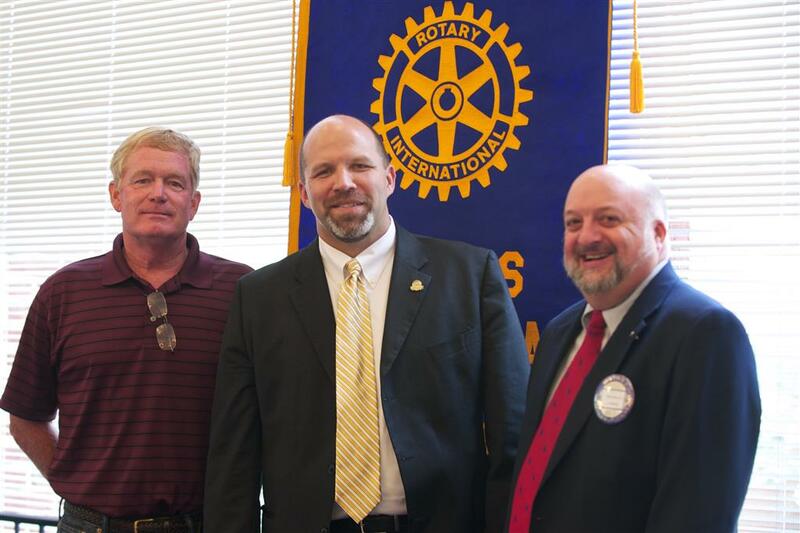 On March 1, 2013, Gary Knotts, former Major League Baseball Pitcher visited the Athens Rotary Club. 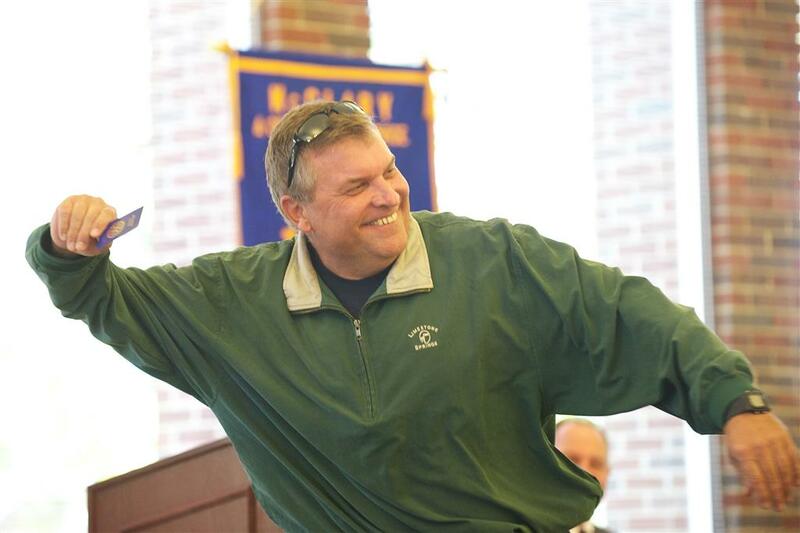 Gary discussed many aspects of his baseball career including his time with the Florida Marlins and Detroit Tigers. 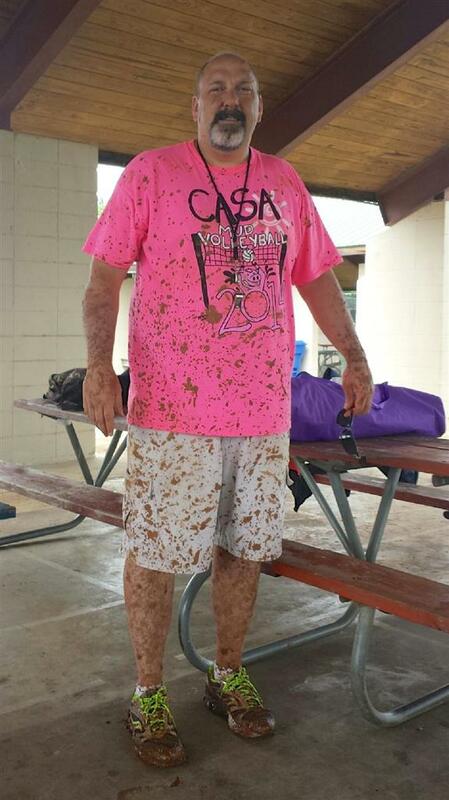 We thank Gary for taking time to be with us. 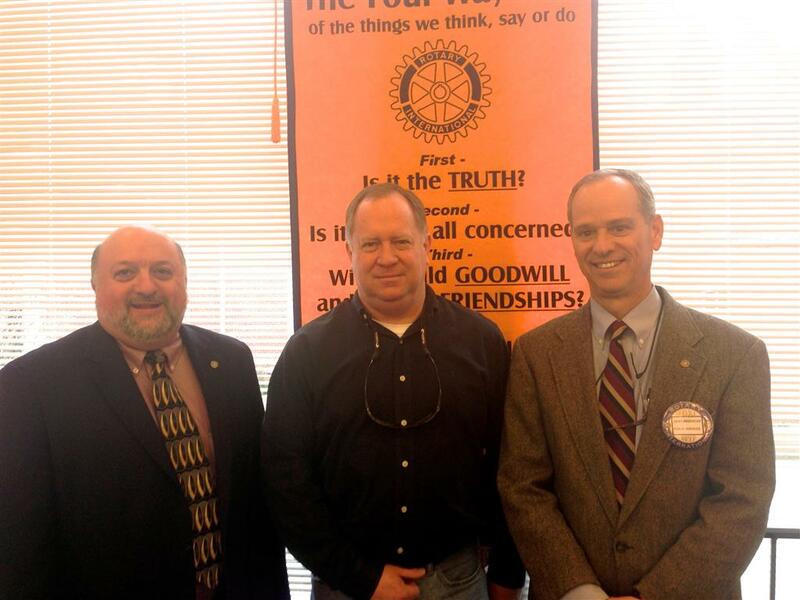 Gary Knotts (Left) is shown here with Athens Rotarian, Charles Morrison (Right). 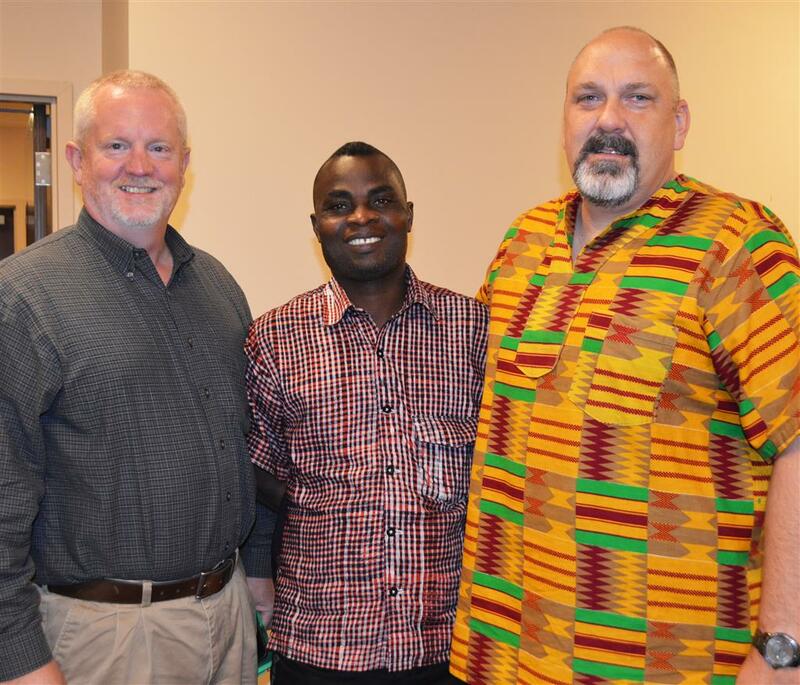 40 Years of Service Recognized! 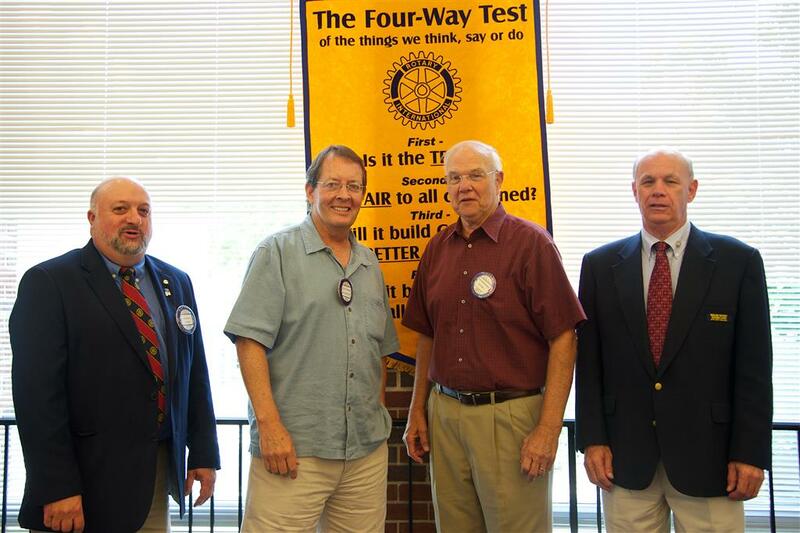 Our new Four Way Test Banner was donated in honor of Bill Hightower for his 40 years of service to the Athens Rotary Club. 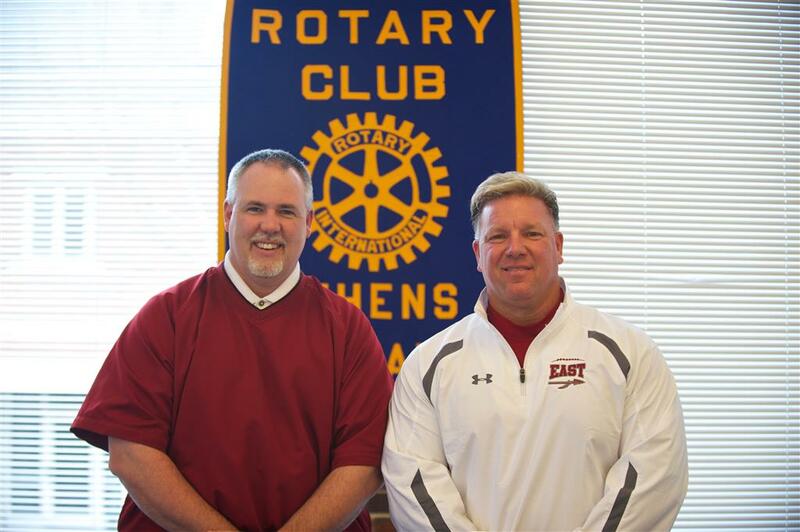 Club President, Jason Thomas (Left) and Bill Hightower (Right) are shown here with the new banner. 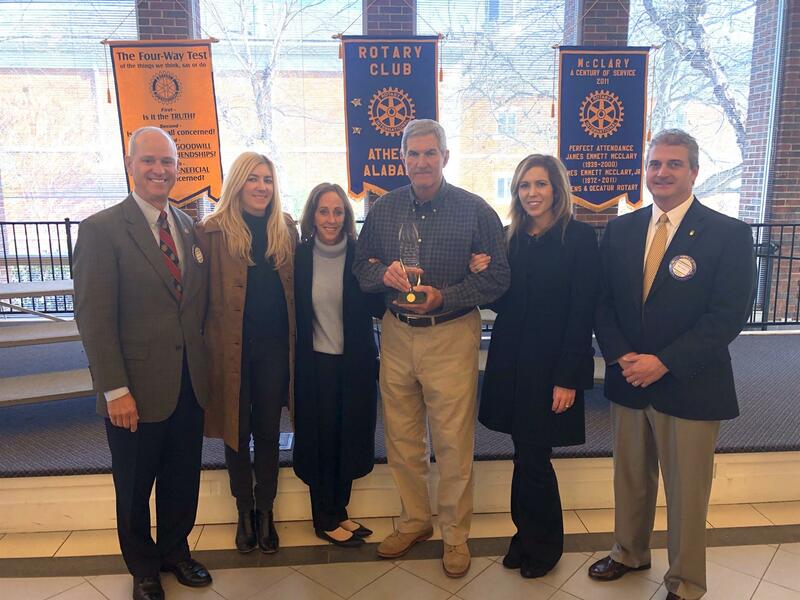 Thanks to Bill for his dedication and service to our club! 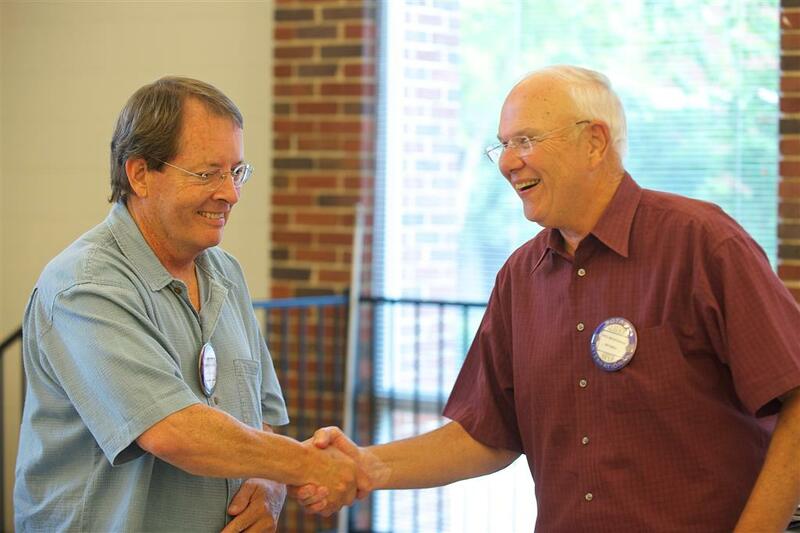 H. K. Derryberry and Jim Bradford shared their inspiring story of friendship with the Athens Rotary Club on February 8, 2013. 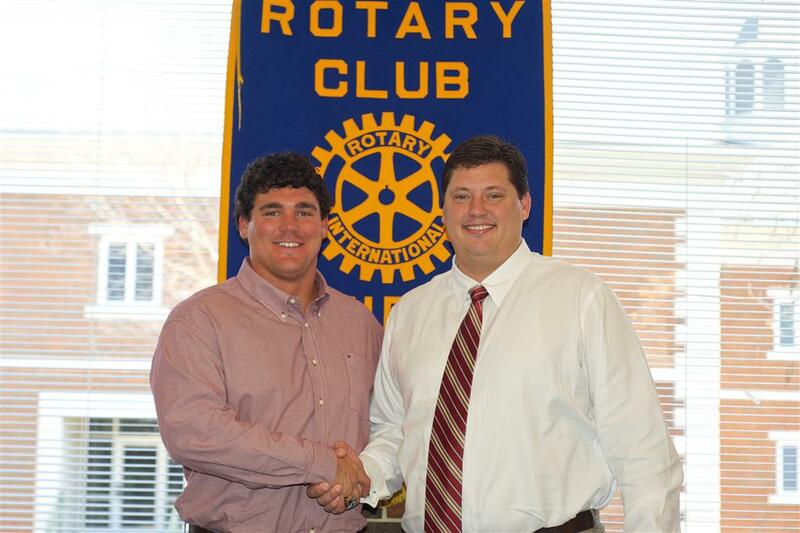 Jason Thomas presented H. K. with an honorary membership in the Athens Rotary Club. 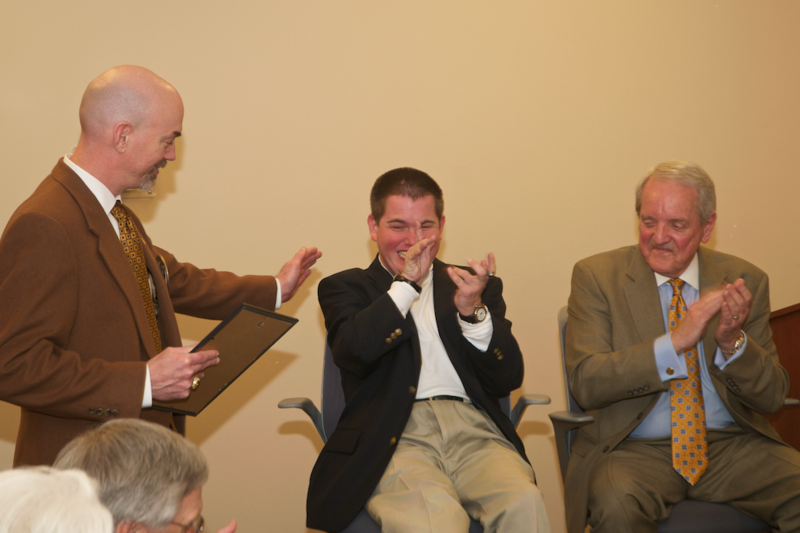 Mayor Ronnie Marks presented H. K. and Jim with Keys to the City. 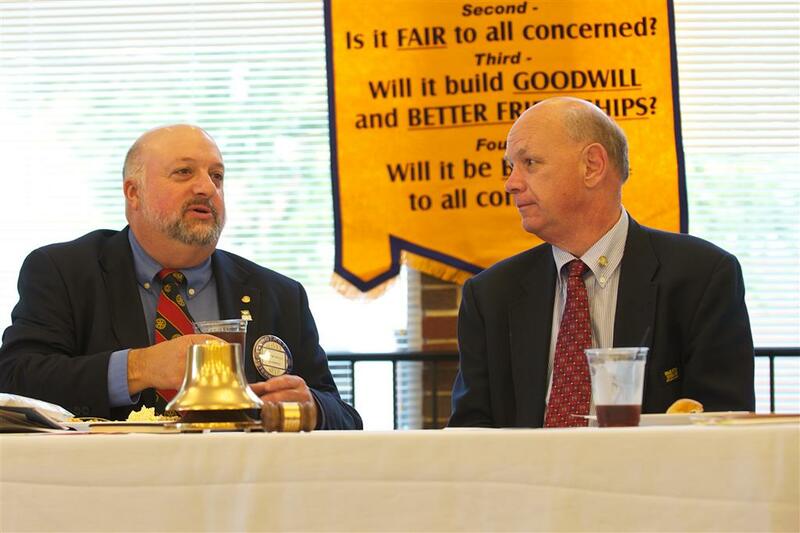 Rotary District 6860 Governor Phil Williams inspired Athens Rotarians with his presentation on August 10, 2012. 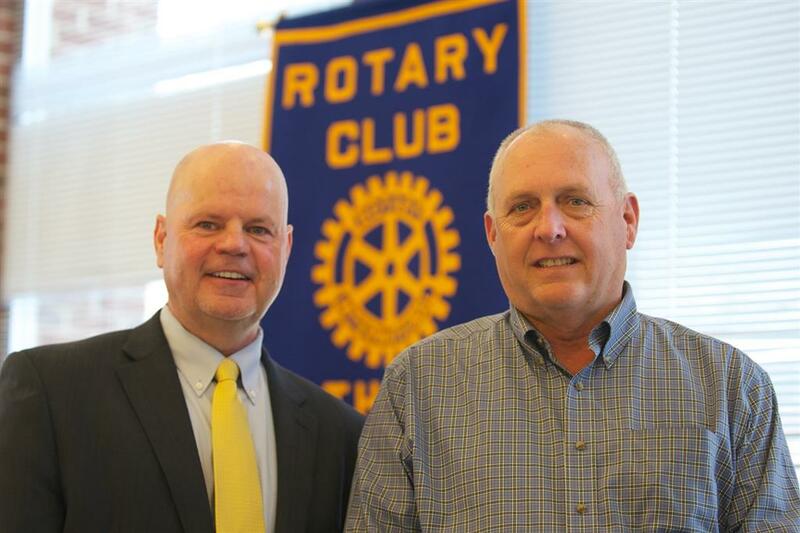 Governor Williams discussed many aspects of how Rotary is making a difference in the world and in our communities. 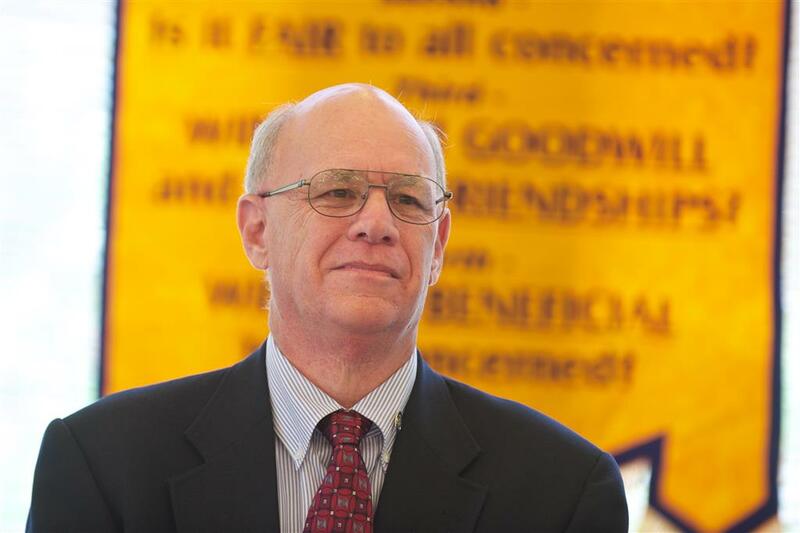 He encouraged the membership to tell what Rotary is doing. 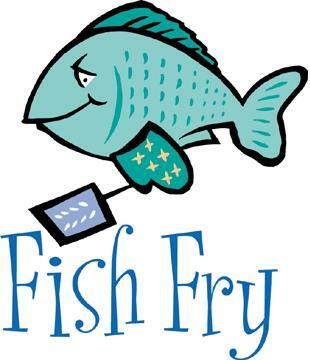 Don't forget that our April 25th meeting will be held at Emmanuel Baptist Church in support of the Veterans Museum Fish Fry. 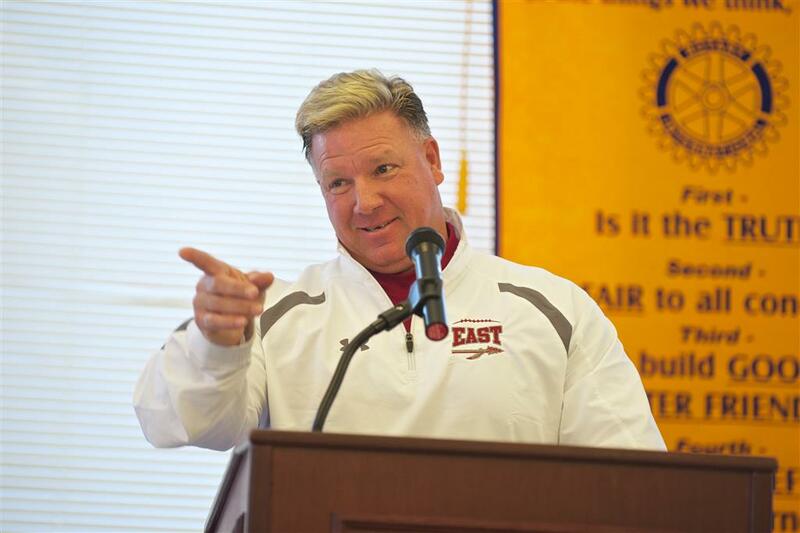 East Limestone head football coach Jeff Pugh discussed his love of growing up in Athens and Limestone County, mentoring young men though football, and the Athens/East Limestone rivalry. Coach Pugh instills in his players that God, family, and education must come before football. 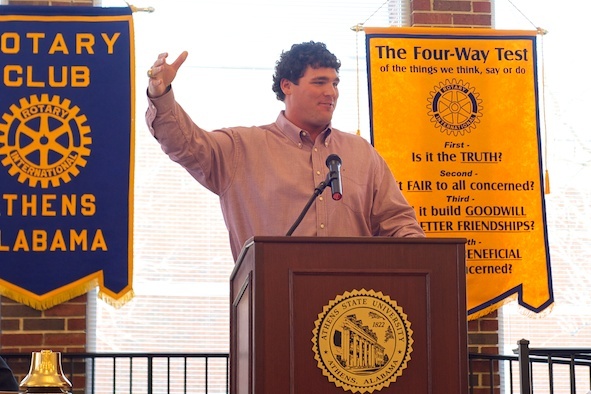 Baron Huber shared his entertaining, and inspirational, story of determination and perseverance in following his dream to play Division I football. Baron's athletic career culminated in a 2009 BCS Football National Championship with the University of Alabama.